scientists in the Republic of Estonia. Report is a faithful reflection of the Estonian reality and can be used as the basis for the actions of decision-makers in both politics and the economy, as well as in other fields. EIA methodology is based on the international standard of Human Development Reports, which have been published by the United Nations Development Programme (UNDP) since 1990. By taking into account the large number of indicators, each country in the world is ranked every year by the Human Development Index, which helps to compare people’s real quality of life in different countries. 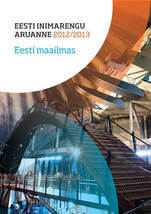 Estonian Cooperation Assembly has published the Human Development Report since 2006. Human Development Reports are compiled as follows: The Council of the Estonian Cooperation Assembly set the topic of the report, which is issued every two years. For supplying the topic with content, the Head of the Cooperation Assembly seeks an Editor in Chief via invited tender. The Editor in Chief must be a post-doctorate researcher (preferably a professor) in an Estonian public university and the article authors must come from at least three Estonian universities. The Editor in Chief and his proposed editors team are elected by the Council of the Cooperation Assembly. Report is financed from the Cooperation Assembly’s budget. Estonian Human Development Reports can be ordered via electronic form or purchased from the Estonian Cooperation Assembly office (Tõnismägi 3a-7, Tallinn). 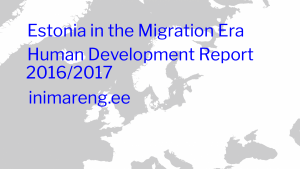 The Human Development Report 2016/2017, entitled “Estonia in the Migration Era” concentrates on the influences of new migration era, trans-nationality, cohesion in society, the future existence of the Estonia’s population, and language and culture. 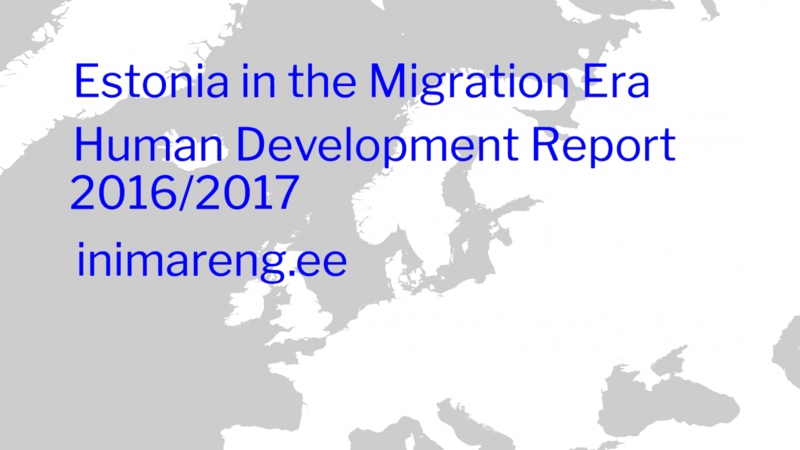 The main message of the Human Development Report is that Estonia’s size of population will not be maintained without migration. Hence, Estonia has to decide whether we want to manage migration in a favourable way for us or merely respond to self-forming immigration. In the opinion of the authors, Estonia needs a proactive policy on how to solve the fall in the the size of its population, migration issues and integration problems. The Estonian Human Development 2016/2017 is produced by Tiit Tammaru, editor-in-chief, Professor of Urban and Population Geography at the University of Tartu, co-editors Kristina Kallas and Raul Eamets from the University of Tartu, and 40 authors. The authors are from University of Tartu, Tallinn University and the Tallinn University of Technology. Read more about the compilation process. The Estonian Human Development Report 2014/2015 ‘Avoiding pitfalls’ focuses on the long term development strategy ‘Sustainable Estonia 21’ approved in the parliament ten years ago and looks at its role and effect on decision making and development in the recent past. Among other things, the report is looking to answer the question whether the development strategies suggested by scientists ten years ago were correct and are they achievable also today, whether the strategy ‘Sustainable Estonia 21’ has fulfilled its purpose and if and how this strategy should be implemented with ten years of additional knowledge. The Human Development Report 2014/2015 ‘Avoiding pitfalls’ editor in chief is Raivo Vetik, professor in the Tallinn University. The report consists of five chapters: Growth of Wellbeing, Effects and Perspectives (Erik Terk), Social Cohesion (Ellu Saar), Environment and People (Mihkel Kangur), The Development of the Estonian Cultural Space (Marju Lauristin), Developing Sustainable Politics (Georg Sootla). The Estonian Human Development Report 2012/2013 ‘Estonia in the World’ that analyses Estonia’s position in relevant surveys and gives a glance to the methodologies and background of making international comparisons. The report is divided into five chapters: Human Development (editor in chief Mari Heidmets), People and Society (Marju Lauristin), Wellbeing and Quality of Life (Anu Toots), Economy (Jüri Sepp), Globalisation and Patterns of Politics (Erik Terk). The Estonian Human Development Report 2009 (editor in chief Marju Lauristin, editors of chapters: I Ain Aaviksoo, II Kaja Peterson, III Rivo Noorkõib, IV Rein Võõrmann, V Veronika Kalmus, VII Erik Terk). 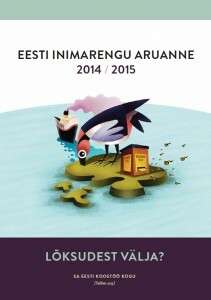 The publication is illustrated with the winning works from the competition ‘It’s Good to Be in Estonia’. The Estonian Human Development Report 2008 (editor in chief Marju Lauristin, editors of chapters: I Ene-Margit Tiit, II Ain Aaviksoo, III Dagmar Kutsar, IV Triin Vihalemm, V Veronika Kalmus, Margit Keller, Pille Pruulmann-Vengerfeldt, VI Erik Terk, VII Marju Lauristin, Erik Terk). The publication is illustrated with the winning works from the competition ‘My Estonia’. The Estonian Human Development Report 2007 (editor in chief Mati Heidmets, editors of chapters: Raivo Vetik, Mati Heidmets, Marju Lauristin, Erik Terk). The publication is illustrated with the winning works from the children’s drawing competition ‘My Estonia’. An important discussion over The Human Development Report as an important state level question was held in the parliament on the 18th of September 2008. The Human Development Report 2007 is available electronically in Estonian and in English. The Estonian Human Development Report 2006 (editor in chief Mati Heidmets, editors of chapters: Raivo Vetik, Juhan Kivirähk, Erik Terk, Mati Heidmets). The publication is illustrated with the winning photos from the competition ‘My Estonia 2006’). The Estonian Human Development Reports can be ordered thought on-line form. It is also possible to purchase them on spot from the office of The Estonian Cooperation Assembly (Roheline aas str 5, Tallinn). During the years 1995-2003 the Estonian Human Development Report was published by the Tallinn University. Majority of these reports are electronically available: 1995, 1996, 1997, 1998, 1999, 2000, 2001, 2002.